This learning activity is a climate change musical for K-12, youth groups or faith organizations. Shine weaves together climate science and performance art into a fun and powerful story, which spans 300 million years of geological time to convey how humanity, energy, and climate are interrelated. The duration of this learning activity depends on whether teachers choose to do the entire activity or choose specific modules to implement. It could be implemented as a one-day intensive, but it is more likely to be implemented over several weeks or months. Increasing demand for and limited supplies of fossil fuels affects quality of life. 7.4 Fossil fuel supplies are limited. Energy affects quality of life . Fossil and bio fuels are organic matter that contain energy captured from sunlight. 4.3 Fossil and bio fuels contain energy captured from sunlight. Various sources of energy are used to power human activities . Social and technological innovation affects the amount of energy used by human society. 6.5 Social and technological innovation. The Sun is the major source of energy for organisms and the ecosystems of which they are a part. 3.1 The Sun is major source of energy for organisms and ecosystems. Biological processes depend on energy flow. The flexibility built in to the activity allows teachers to take on the entire musical or pick and choose between modules to implement in their classrooms. Watch the trailer (2 min.) and the full performance (22 min.) to get familiar with the project and generate ideas for local application. 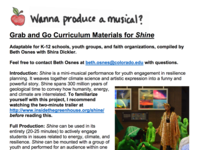 Beth Osnes (beth.osnes@colorado.edu) is a great resource to support educators who want to put on Shine. This activity allows students to develop and perform a musical about climate change. Students can explore topics such as past climates, the carbon cycle, formation of fossil fuels, photosynthesis, the industrial revolution, modern climate change and solutions to climate change. This is great exercise for both the actors and audience to demonstrate the overall concept of the changing climate from the start of fossil fuel creation to how humans are influencing the carbon cycle. The goal of this project is to create a performance experience for youth around climate change. This activity further works to inspire and equip youth to create local solutions for inclusion in their city's plan for climate resilience. Beth Osnes at beth.osnes@colorado.edu, the creator of the performance, will support instructors who want to use this resource. The documentation provides detailed instructions for teachers. However, taking on the entire activity (all of the modules) will require a lot of coordination by the educator. Make sure to give enough time and go through the modules and example videos carefully. This performance can be done in a single, intensive day, but is better suited to a 1-2 week time frame. MS-ESS2.A1:All Earth processes are the result of energy flowing and matter cycling within and among the planet’s systems. This energy is derived from the sun and Earth’s hot interior. The energy that flows and matter that cycles produce chemical and physical changes in Earth’s materials and living organisms.